Who didn’t love YoYos? They were one of the biggest crazes of the 90s and early 2000s. Well, they’re back and more advanced than ever! Originally from Ancient Greece, YoYos were known as Bandalore. They were made famous in the 1920s and grew bigger during the 1960s and 1990s. YoYo Factory was founded in 2003 by USA based Yo-Yo superstar YoHans. YoYo Factory focuses on creating yo-yos that make playing more enjoyable. We came across them at London Toy Fair 2017, where they showed off some of their yo-yos and tricks. One of our junior Clubit presenters had a chance to learn a couple of tricks. Their range of yo-yos accommodate for beginners (Ten Trick £3.99), intermediate (FAST 201 £9.99) and advanced (DV888 £22.99). 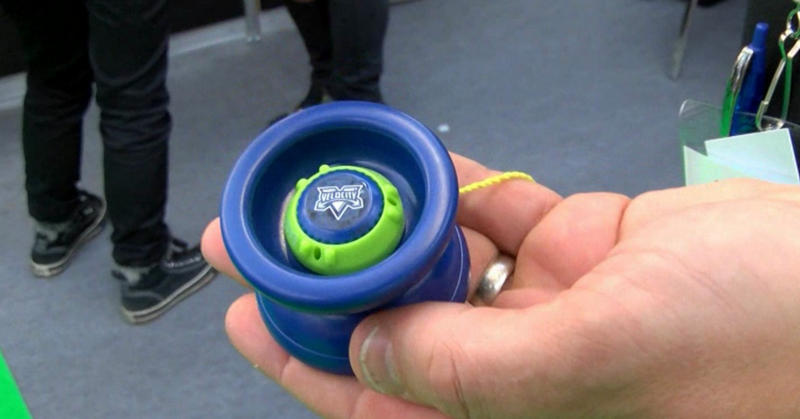 One of their most versatile yo-yos is the Velocity, shown in our video above. The adjustable bearing means you can use it for simple throwing, or at the turn of a dial turn it into a performance yo-yo. YoYo Factory also sponsor a number of competitive yo-yoers at the World Yo-Yo Contest. You can learn some jaw-dropping yo-yo tricks and impress everyone with your new skills! You can find more videos from London Toy Fair by subscribing to our YouTube channel.